In simultaneous interpretation, the interpreter renders the message in the target-language simultaneously while the message is being delivered. As this kind of interpretation is very demanding, a single interpreter can usually handle simultaneous interpretation duties only for up to 20 minutes. Any assignment exceeding this time limit would require two interpreters so that they can alternate and alleviate the work load. 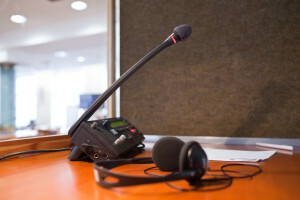 Simultaneous interpretation requires the use of special equipment such as sound proof booths and interpreter consoles along with wireless headphones and microphones. It is mostly used in large meetings, conferences, speeches and board meetings. Does simultaneous interpretation require special equipment? As the interpreter speaks simultaneously with the presenter, simultaneous interpretation settings necessitate special equipment such as interpretation booths, interpreter consoles, microphones and wireless receivers. Our project managers would gladly walk you through all the necessary equipment for your event and makes sure that everything is in functioning order for your event. How do I determine what type of equipment my meeting needs? Our project managers would gladly walk you through all the necessary equipment for your event and makes sure that everything is in functioning order for your event. What are the advantages of simultaneous interpreting? As it allows near-real time interpretation in many languages at the same time (think United Nations) simultaneous interpretation truly is the epitome of the interpretation profession. It is the most efficient interpretation type. What are the disadvantages of simultaneous interpreting?Simultaneous interpreting tends to be more costly than other interpretation types due to the fact that additional equipment, technicians and more than one interpreter is involved. It however yields better results for the participants and provides a much better flow to meetings. Are additional interpreters really necessary for simultaneous settings?Simultaneous interpretation is very taxing on linguists. It is not possible to maintain an acceptable level of simultaneous translation quality for periods of over 15 – 20 minutes. That is why simultaneous interpreters work in pairs and alternate rest times during assignments.